Bangla word ‘megh’ means ‘cloud’ in English. The term megh often refers to the dull state of mind in Bangla literature. After the birth of their only son when journalist couple Sagar and Runi named him Megh who could imagine that he will have to spend a life with an undeviating gloomy look on his face? But the fate of this innocent child was written in a different way. When his father Golam Mostafa Sarowar (Sagar Sarowar), news editor of Maasranga Television, and mother Meherunnesa Runa (Meherun Runi), senior reporter of ATN Bangla, were brutally killed on February 11, 2012, in the bedroom of their rented apartment in the capital’s West Rajabazar, Megh was the only person spared alive to call his grandmother from his mother’s cell phone to inform that both his parents had been killed. Back then he was only five years old and studying in nursery class. After that in the last six years several times he took to the streets claiming justice for his parents’ murder. But his efforts went in vain as all the law enforcement agencies involved in the investigation of the case have failed to identify and catch the culprits. Mahir Sarowar Megh has turned 11. In absence of his parents he has been leading a luckless life. According to his maternal uncle and other family members, initially he cried a lot for his parents, but with the passage of time (as he grew up), he became silent about them. Now he understands that his parents will never come back. The issue is so sensitive that no one asks him anything about it. Only God knows how he feels when he thinks about his parents’ vicious murder. It was early hours of Saturday. Runi and Megh were inside the flat. 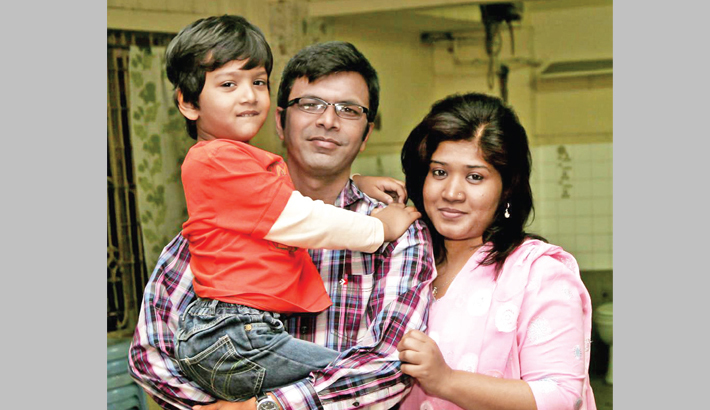 Sagar had returned home around 2:00am when his office car dropped him off. Probably the killers were known to them and they had dinner together on that fateful night. The journalist couple had no idea that they would be murdered by their familiar persons. Whether it was personal or professional, but there was certain reason that went against the interests of the killers. Thus they planned to eliminate the journalist couple. The ghastly twin murders were committed sometime between 2:00am and 5:00am. Mainly sharp knives were used to stab and kill them. A total of twenty eight stab wounds were found in Sagar’s body and five stab wounds was in Runi’s body. Sagar’s hands were tied at the back with a scarf and his legs were bound with another scarf. It seemed that the killers had more anger towards Sagar and they were not professionals. If the assassins were professionals, they would not have made so many stabs. The rooms of the flat were found virtually ransacked though without two laptops nothing was missing. The iron grill of the kitchen window was cut but the hole did not appear large enough for an average person to get in or out. So, the murderers’ intention was to show the incident as an unplanned and sudden killing by the thieves. Immediately after the gruesome occurrence Runi’s brother Nowsher Alam Roman filed a murder case with Sher-e-Bangla Nagar police station. Within a couple of days Detective Branch (DB) of police took charge of the investigation. The then Home Minister Shahara Khatun, while visiting residence of the slain journalists, had thundered that the killers would be identified and arrested within 48 hours. On February 13, 2012, the then Inspector General of Police Hassan Mahmood Khandker had claimed ‘remarkable’ progress in the probe, promising the nation ‘good news’ soon. But all their remarks were proved fruitless. 62 days later DB confessed in the court that they couldn’t make much progress. Then the court instructed Rapid Action Battalion (RAB), the elite crime-bursting force of the country, to take over the case. Being an agency responsible for hunting down and arresting perpetrators RAB is conducting investigation but they have not been able to get to the bottom of this case yet. They have so far questioned 127 persons on the matter and arrested 8 accused, namely Rafiqul Islam, Bokul Mia, Masum Mintu, Kamrul Hasan Orun, Polash Rudro Pal, Tanvir Rahman, Abu Sayeed and Enam Ahmed. Among them caretaker of the house Polash Rudro Pal and Sagar-Runi’s family friend Tanvir Rahman are in bail now. RAB had sent DNA samples of 16 suspects to the US along with a knife and samples of clothes as crime-scene evidence. According to forensic report, two people were involved with the killing. After receiving the report RAB informed that forensic specialists didn’t find any similarity between the killers’ DNA and the DNA samples of the suspects. Following a Dhaka court instruction, ASP Mohiuddin Ahmed, the investigation officer of the case, submitted a total of 8 progress reports before it. The court fixed 54 dates in the last six years asking RAB to submit the probe report, but the investigation officer always sought more time! In the most recent development of the case on February 1, 2018, the court ordered to submit the charge sheet of the case on March 13. In all the third world countries oppression of journalists has been a common practice. Bangladesh is no exception in this regard. Whenever any news report goes against their economic or political interests, influential quarter of the society either tries to stop journalist’s pen by providing bribe or attacks him/her out of discontent. There are allegations against the legislature that it often formulates laws to control freedom of press. According to Committee to Protect Journalists (CPJ), at least 21 newsmen were killed in the country in the last couple of decades. And among these murders justice was ensured only for a single incident! That’s why not so many people were surprised when Bangladesh ranked 10th in the Global Impunity Index 2017 prepared by CPJ. Notorious killing of two reputed TV journalists like Sagar Sarowar and Meherun Runi right at the heart of the capital was a shockwave to the media world. But after the nasty murder what happened in the last six years about this sensational case is not merely an example of oppression to journalists, rather the case has become a symbol of frustration over the investigation process of the law enforcement agencies. Since the ghastly murder of journalist couple, investigative agencies have not yet been able to even identify the alleged killers, let alone arrest them and put them on trial. It seems that either our law enforcement agencies know the powerful persons involved in the killing, but want to protect them or they are incompetent. Whatever the case is, murderers of Sagar-Runi should be brought to book with a view to bringing an end to the culture of impunity and ensuring a fair justice system. And of course, this must be done to console a tender-aged child who is growing without the love of his parents.